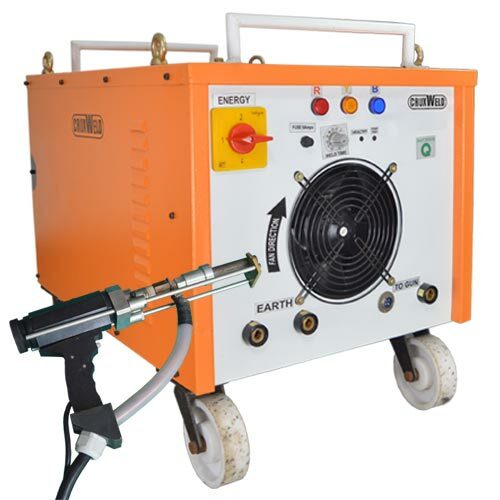 Stud Welder – Resistance Welding Equipments Manufacturers India. Manufacturer of Capacitor Discharge and Drawn Arc stud welder required in industries. It is a special form of arc welding where a permanent joint is made with large workpieces & studs. This is a time-saving procedure where arc ignited directly between pins /studs with a workpiece and cause arc inlet and outlet area melted. The two melted parts pressed together with a measured pressure to make the joint permanent. 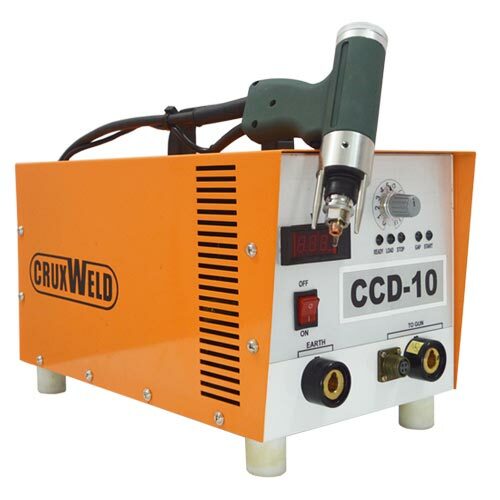 The stud welding machines are of two types Capacitor Discharge/Tip Ignition and Drawn Arc. Both the methods are identical but differ only in the way arc is produced. The Capacitor Discharge is used in the facade construction, apparatus construction, building, housing and enclosure industries. The Drawn Arc is used in stud diameter of 2-22 mm for structural steelwork, boiler construction, mechanical engineering and in shipbuilding. In stud welding surface must be conducive and the paint etc should be removed from the surfaces.